There’s something about the current UK heatwave that’s making me dig out the French Provencale recipes I ate as a child when we used to spend scorching summer holidays in Marseilles with my family. When I rub the leaves of the basil plant outside and it smells so strong it could almost be skunk, I think of hot, lazy days being bored as a teenager in France, crunching dry fig leaves and bark underfoot as my brother and I waited for yet another massive family meal to be dragged onto the table outside. 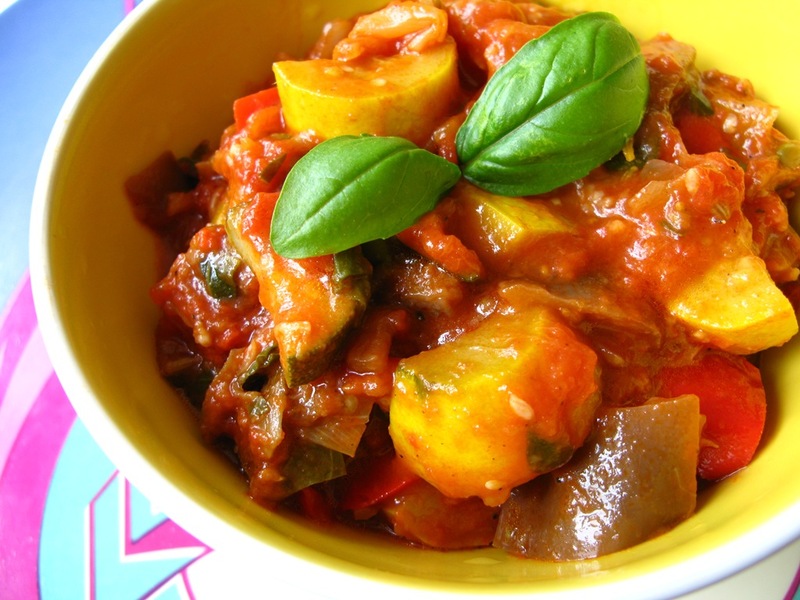 While I didn’t like the heavy lamb dishes that were sometimes part of the menu (it makes me go URGH to this day) I always loved great big ladlefuls of ratatouille that went with it, the workaday summery Southern French vegetable stew brewed up in vats by my grandmother and aunt. It’s proper hearty peasant food, and a great way to use up lots of summery veg while packing a fistful of flavours into one pot. Bold, garlicky and herby, it’s rich with tomatoes and soft, Mediterranean vegetables that taste at their best now: red peppers, courgettes and aubergines. I’ve added a few personal tweaks – you don’t necessarily have to add capers, fennel seeds, paprika or anchovy, but I think it really ramps up the flavour. Don’t be shy with the garlic, and defo don’t hold back on the basil at the end – you could easily use up a whole plant here. And it’s GREAT eaten cold on a hot day. Get a heavy-bottomed casserole dish on the hob and at the ready. Chop the onions into dice, and sweat down over a medium heat in about 4 tbsp olive oil. Then add another tablespoon oil plus the aubergines. Cook these for a few minutes, stirring now and then so they don’t stick, with the casserole lid on so that they steam. When soft, add a bit more oil and the peppers, fennel, courgettes and fennel seeds, stir around and cook for three minutes with the lid on. When all the veg is softened – but not collapsing (you don’t want mush) add the garlic and fry off in a bit more oil for 1 minute. Then tip in the hot paprika, bay leaves and rosemary sprigs, followed by the tinned tomatoes. 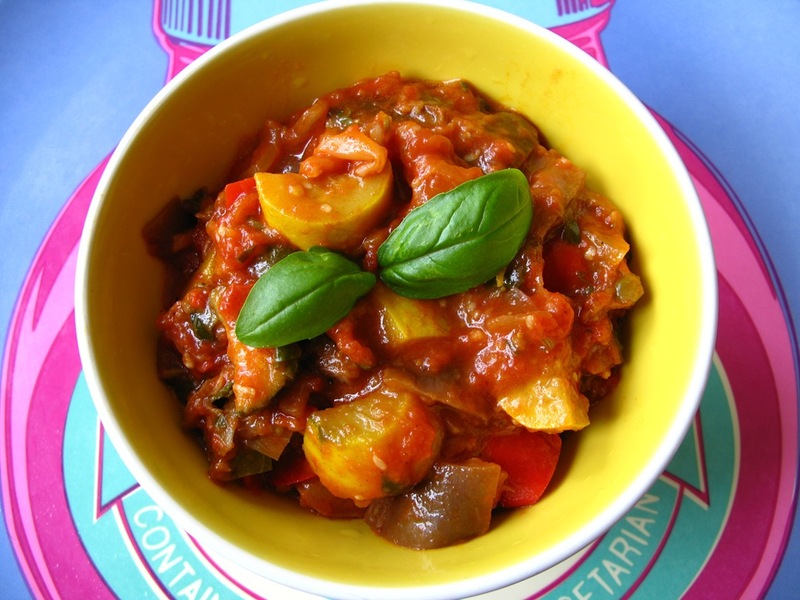 Trick – if your tomatoes are plum ones, chop them up easily in the pan using scissors. Then add the anchovy fillets (which will melt in the sauce) and capers. Add a tablespoon more olive oil. Give everything a good stir, then let it all bubble away for about 20 minutes on a low heat. Just before serving, roughly chop your basil leaves and mix them in, then season to taste. You can eat this on its own, drizzled with a bit more olive oil and served with a hunk of crusty bread, with rice or butterbeans, or as an accompaniment to grilled meat or fish. If you’re feeling in need of a comforting hug in a bowl, eat it ladled over a baked potato with loads of strong grated cheddar cheese on top. That’s my British half coming to the fore, innit.